There are two paintings we will look at so as to deepen our understanding of this Jesus parable. 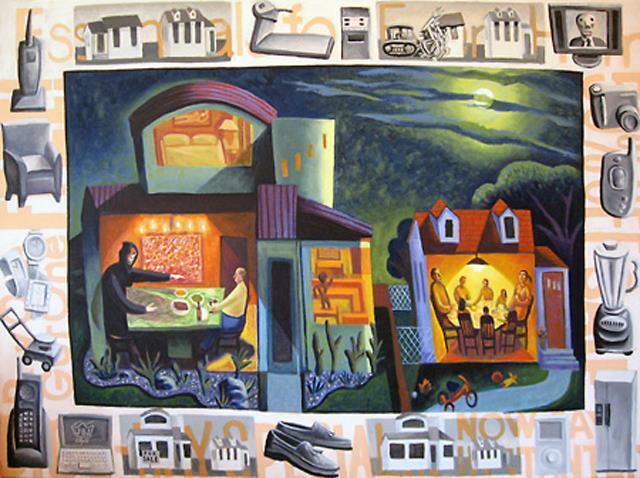 The first one is a modern painting by Jim Janknegt called The Rich Fool. Of course, the artist is attempting to show the layers of consumerism that we as human beings buy into—thinking that we have to fill our houses with such things. We are convinced, coerced, sold the idea that our houses must be filled with things. You will also notice two houses. The house on the right is small and contains a group of people sitting around a table. The scene is intimate, cozy. The people are oversized—they barely fit in the house, much less the room! But this house is dwarfed by the McMansion on the left. It is huge. One man lives in that house. He sits at a large table alone. Upstairs is his bedroom. The only “company” he has is the personification of death. Around the frame of the painting you may also notice pictures of houses. One house gets bulldozed. The big house has a for sale sign posted. In a video interview, the artist Jim Janknegt shared that he was trying to show that this parable is not saying that material things are evil or necessarily what we shouldn’t do, but that the parable’s point is to show us what we can lose if we obsess over material things. We can end up alone at a big table in a big house with all of our things, but with no one to share life with. The second painting is a well-known work by Rembrandt Van Rijn [1606–1669], also entitled The Rich Fool. In the year 1627 material wealth looked quite a bit different than it does today. There was no Wal-Mart, no cell phones, no computers or televisions. In Rembrandt’s time, books were a sign of great wealth. 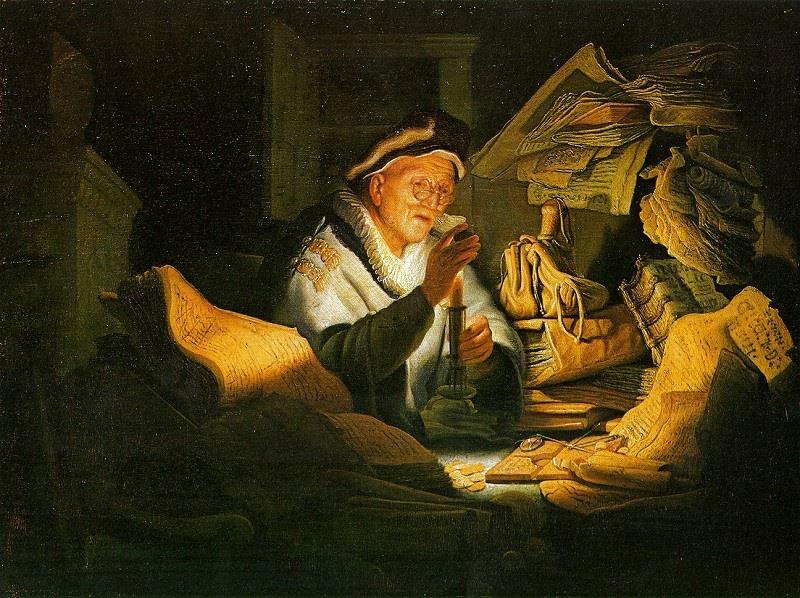 The rich fool, in Rembrandt’s painting, is happily surrounded by his treasures, totally unaware of the darkness surrounding him. His candle is about to be snuffed out and he doesn’t know it. What draws me to Rembrandt’s nearly 400-year-old Rich Fool is what also draws me to Janknegt’s modern work: the sickness of isolation contrasted with the health of relationship and community. The rich fool is a fool because he is not really rich. His books mean nothing. They don’t love him, care for him, or provide life. His books are not evil at all, but because he has chosen to surround himself only with books—to obsess over them—he is isolated from people. And he doesn’t even recognize it. Eventually, he will die in a heap of books in the dark; alone. This Jesus parable in Luke 12 is unique. It is only found elsewhere in the 5th Gospel [the one that didn’t make it into the standard Biblical canon], the Gospel of Thomas. This parable is quite straightforward. Whether your material possessions are a big house with electronics or whether your wealth is books—pick your own contextual wealth. Then, obsess over obtaining more of that material wealth. Stake your life on it. Make all your decisions based on that wealth. Pursue that wealth above all else. Hoard it. Gather as much as you can, willing to sacrifice relationships in order to have more. And then, find death facing you before you can even realize how you’ve wasted a life that could have been a gift full of community, love, care, and relationships. Jesus, in Luke, defines life by stating what life is NOT. Jesus says that life is not about possessions. Even when one has abundance, Jesus says, a person’s life still does not consist of possessions. But just as I pointed out with the house or with the books–the use of possessions for normal, everyday stuff, is not the problem. The problem is when possessions become our lives; when we can’t let them go; when they become more important than people. The danger is in choosing possessions over relationships. Of course, in a consumer-based society, we are actually taught that possessions enrich our life. The more things we have, the better we live. We are sold this idea. We are bombarded with a health and wealth gospel: get more, live better. But Jesus says the opposite. More possessions cause extreme anxiety. The more we have and hoard, the more we worry about those things. People drop their cell phones all the time. I do too. But many freak out about it as if it were the end of the world. They pick it up, rub off the dirt, polish it with their shirt, inspect it to make sure it’s okay, [some even talk to it as if it were alive], and then they rush off to buy a protective covering for it. They must protect that thing at all costs. On the other hand, the same people will have little or no reaction to a child’s poor health due to bad eating habits and lack of exercise; they are unmoved by a depressed, love-seeking friend or family member; they are unaware of their own deteriorating mental, spiritual, and physical health. Will they buy a protective cover for themselves so as to prevent further injury when life drops them? Will they pay into a monthly plan of healthy practices so they live well? Will they check on their relationships as much as they check their phone? Listen friends, don’t get me wrong. Cell phones themselves are not evil. Many material things are necessary to live in this world. In Jesus’ time and now in ours, people work to make money so they can eat, have a place to rest, and care for others, and this of course is not evil. It is when that money becomes our life that we lose everything that matters. It is when material things surround us that we lose the essence of ourselves. And we find ourselves alone and in the dark. Your life is at an end. All this stuff won’t be going with you. Now what? So it is with those who store up treasures for themselves but are not rich toward God. Listen, this phrase has been misused a lot by preachers. I covenant with you that I won’t use this parable or any Bible story to convince you to give more of your money to a church. That’s manipulation. Besides, I don’t think this parable has anything to do with you giving more money to your church. Again, it is about relationships. …this man was a fool because he failed to realize his dependence on others. Now if you read that parable in the book of Luke, you will discover that this man utters about sixty words. And do you know in sixty words he said “I” and “my” more than fifteen times? This man was a fool because he said “I” and “my” so much until he lost the capacity to say “we” and “our.” He failed to realize that he couldn’t do anything by himself. This man talked like he could build the barns by himself, like he could till the soil by himself. And he failed to realize that wealth is always a result of the commonwealth. This focus on the material stuff only distracts us from the eternal stuff of relationships. People don’t get involved with a church because of the building or the stuff a church owns. People are part of faith communities because of the relationships they form. they are not alone; they are rich in relationship. In any faith community and in any life for that matter, relationships are our treasure. So I encourage all of you as individuals to choose relationships over things. I challenge you as a whole church to choose community over things. Focus on this. Put your energy into this. Pursue this. Care for your relationships. Do this, and you will truly live. Rev. Dr. Martin Luther King, Jr., “Why Jesus Called a Man a Fool,” preached at Mount Pisgah Missionary Baptist Church, Chicago, Illinois, on 27 August 1967.